Sheep shearing has traditionally been a male dominated industry. In the 1980s there were over 15,000 fulltime sheep shearers in New Zealand, only 5 of those where female. She Shears follows four female shearers in the buildup to the Golden Shears, the worlds most prestigious shea... read full description below. Sheep shearing has traditionally been a male dominated industry. In the 1980s there were over 15,000 fulltime sheep shearers in New Zealand, only 5 of those where female. 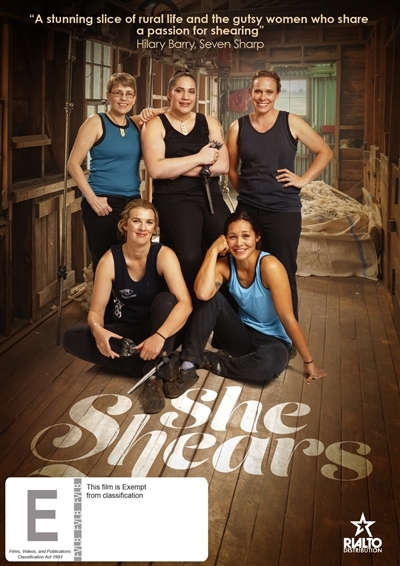 She Shears follows four female shearers in the buildup to the Golden Shears, the worlds most prestigious shearing competition. For these women, competing requires enormous tenacity and much back-breaking work. Driven by passion and a competitive spirit they strive to take their beloved occupation to the next level. To win the Golden Shears is every shearers dream. But for our characters, its more of a chance to demonstrate their skills and determination. As the competition draws near, the women must contend with exhaustion, injury and self-doubt - and family obligations are an ever-present demand. Win or lose, heartbreak or joy, what persists is their passion for what they love to do most - shearing.